Cooking on Saturday afternoons is not usually on my agenda. However, since it’s such a cool, rainy/snowy Saturday afternoon, I felt encouraged to throw a little something together. 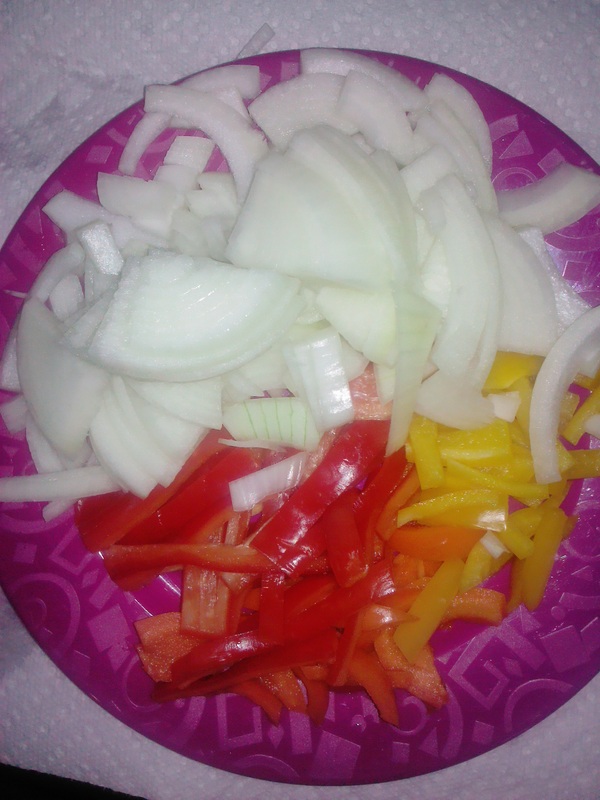 Chop onions, peppers and set aside. Add pork loin, turkey, or chicken to stir fry pan. Add olive oil, soy sauce, spices and slowly brown. Once meat is thoroughly brown, add onions, peppers, stir-fry sauce, red wine vinaigrette, and crushed red peppers. Cover and simmer on low until vegetables are tender. *Both items are still high in sodium, so use them sparingly. If I could find a substitute with even less sodium, I would use it. But both the soy sauce and teriyahki sauce add such great flavor, I cannot resist! You can also add broccoli, zucchini, fresh carrots, spinach or other vegetables to this dish. At the last-minute, I found a bunch of broccoli rabe in the fridge, so I cut them up and tossed them in the pan. We’re enjoying the stir-fry for dinner served over brown rice, cooked in 100% natural chicken broth. It’s tasty, spicy, and has a little kick to it. I hope that you try it and that you enjoy it. This was a quick throw together meal, but tastes like I slaved over it. Lol! This entry was posted in Family Living, Healthy Eating and tagged Bell pepper, brocolli rabe, brown rice, chicken, chicken poultry, Cook, medium yellow pepper, orange pepper, poultry, quick dish, red wine vinaigrette, Soy sauce, stir-fry. Bookmark the permalink.